Thank you for all the helpful information on your blog, especially what you have written about sesamoid injuries. I have also begun reading your book, which I find very helpful and educative. Yet I need to ask you some questions about my specific “sesamoid case”, and I do hope you have the time to answer them as I am clueless on what to do from here. I am a 27-year-old woman, and I have been struggling with pain in my left foot for about 8 months. It began in the end of March 2016 and I cannot recall having hurt my foot in any way. After the pain began in March, I didn’t pay it much attention because I just thought it was the same kind of pain I have experienced before. I stopped jogging for a while and tried to wear better shoes, but the pain kept increasing. It was highly affected by the level of activity – I could be almost pain-free when I awoke in the morning, but during the day the pain would increase, even after short walks. I have tried to think about possible causes, but cannot think of any, other than that I have a high-arched foot. Dr Blake's comment: High Arched feet are a curse on shoe buying and both heel and ball of the foot pain. Too much pressure is put normally in these areas leading to injury without apparent cause. Since the pain didn’t go away, I went to see my GP in June. She sent me to x-ray, which showed both of my sesamoids to be split or bi-partite – I was told that this might indicate stress fractures, but they could also be naturally occurring. Nevertheless, my doctor recommended me to wear stiff-soled shoes for about 4 weeks to see if the pain would subside. Dr Blake's comment: This was good initial advice. 6 weeks later the pain was even worse, and I had trouble walking short distances. I went back to see my doctor in the beginning of September, and then she sent me to MRI, which showed the same split in both of the sesamoids in the left foot, in addition to bone marrow edema. My doctor interpreted this to confirm the diagnosis of sesamoid stress fracture, and not naturally occurring bi-partite sesamoids. She then referred me to an orthopedic specialist, and I was told to use an even more stiff-soled shoe (which is actually a post-operative shoe, as I had trouble finding a shoe with soles stiff enough) while waiting for the appointment with the orthopedist. She also recommended me to be even more conservative with weight-bearing. I used crutches for some time (about 3 weeks), and the pain got better – but only when not putting much weight on the foot. When I tried to walk a bit further than walking around in my apartment, the pain got worse and was about the same as before. Lately I have also begun experiencing the same kind of pain in my right foot. However, x-ray of this foot was normal, although I was told it cannot be ruled out that I might be developing a stress fracture in this foot as well unless an MRI is taken (which has not been done). Dr Blake's comment: Hopefully, you are making dancer's padding for both sides to help the left and protect the right. You can get the 1/8 inch adhesive felt at www.mooremedical.com and design your own. A couple of days ago, I finally had the appointment with the orthopedist. However, this was far more confusing than helpful for me. 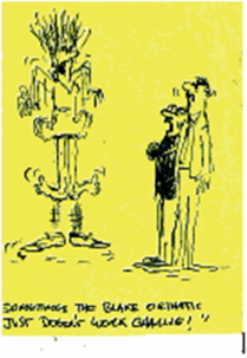 In contrast to what my doctor had recommended, he told me not to wear a stiff-soled shoe. Rather, he recommended orthotic soles to relieve pressure on the sesamoids (I haven’t had these made, yet), in addition to seeing a physical therapist. He said my gait was wrong due to being in pain for several months (which I admit is true). However, what confused me the most was that he said he found it very unlikely that my sesamoids would ever heal. My immediate reaction to this was of course that I thought my foot would never be ok again. I asked him repeatedly what he meant, but didn’t get a clear explanation. Having thought about it afterwards – and having read about different sesamoid injuries myself – I think he might have been unsure as to if I have an actual sesamoid fracture. In my understanding, the treatment he has recommended indicates that he might think I have sesamoiditis rather than sesamoid fractures, and that the non-union of my sesamoids might be naturally occurring. However, he never expressed explicitly his view on diagnosis to me. Further, when I asked about how I should “treat” my injury in a practical sense – e.g. should I walk for more than a few minutes on the foot even though it hurts; should I use crutches; can I drive in spite of the pain; and so on – I got no or very vague replies. These questions have important practical implications for me, and I feel I have no one else to ask. Dr Blake's comment: Golden Rule of Foot: Sesamoid Fractures Rarely Never Heal. I find that they can take awhile, but they heal. Even if you are stiff soling it, trying to transfer to the arch and off the big toe joint is a great idea. - Although I didn’t think about it at the time (but I have after reading your blog), I think my intake of vitamin D and calcium was far below the recommended levels prior to the pain debuted – yet I think I am too young to have any osteoporosis-issues although I haven’t had a bone density scan. Dr Blake's comment: There is an epidemic of Vitamin D deficiency leading to stress fractures, so it only takes a couple of months of low Vitamin D3 to cause a stress fracture. At least see if you can get the Vitamin D level measured and see where you are and what the range of normal is. I love my athletes to be in the middle of the range, around 50-55. 1. It is my understanding that the correct treatment depends (in part, at least) on the correct diagnosis. Can you please help me get a second opinion? Do I have sesamoid stress fractures in my foot or not? Dr Blake's comment: It looks like from the 2 x-rays that I saw that you do have a stress fracture. I was not able to look at the MRI images for some reason. If you can send 2 or 3 images like the x-rays showing the supposed bone edema, that would be great. When there is any doubt however, we must treat it like a fracture, which you are. 2. Could it be that I have naturally occurring bi-partite sesamoids in my left foot, but whole sesamoids in my right foot, and would that indicate that I have sesamoiditis rather than stress fracture? Dr Blake's comment: Sure, but sesamoiditis does not hurt like this. The history is one of a fracture. 3. Is it true that my injury will never heal, and in that case, what is the point of treatment from here? Can some form of healing occur even though the sesamoids stay non-unioned, or is the goal treatment that the sesamoids must be united again? Dr Blake's comment: Some sesamoid fractures do not heal, but the majority do. I am sure that with poor treatment, and mis-diagnoses, your need for surgery goes way up. This is why you emailed in the first place. How can we do inter-galactic (you could be an alien LOL) or at least inter-national consulting? 4. What would you advise me to do from here? Should I continue wearing a stiff-soled shoe, even though the orthopedist told me not to? Should I be wearing another shoe than the one I have now? Can physical therapy help me, and if so, how? Dr Blake's comment: This will take some Q & A. The first thing you need to do is develop a program that you maintain 0-2 pain level? Are you there with your present situation? 5. What should I do about my right foot? The pain is not as bad as in the left foot, but I definitely feel it. Is MRI indicated? If I indeed have a stress fracture in that foot too, how can both of my feet heal? Dr Blake's comment: It is okay to get at least an x-ray on that side, and make sure you are designing dancer's padding for both sides, and some arch support for both sides, and ice pack both sides for 10 minutes twice a day. For the left, if there is bone edema, you should do contrast bathes each evening. 6. I really want to avoid surgery if I can, but: Am I a candidate for surgery, and if so, what kind of surgery would that be? Dr Blake's comment: In my practice, it takes at least one or even two more MRIs to get a feel that surgery is needed. Each MRI is 6 months apart, and there are treatments of contrast bathing, bone health issues, orthotics, dancer's padding, activity modification, foot strengthening, etc. I am happy in separate posts to address each aspect for you. 7. I feel that walking even very short distances is too painful, but how much can or should I walk or even do anything at all? It is really difficult for me to know when there is too much pain (i.e. pain level exceeding 3), so can you please elaborate on how to find that “acceptable pain range”? I’m not afraid of the pain, but I’m afraid of making it worse (and beyond repair) if I try to do too much stuff. Dr Blake's comment: If you can not walk in the 0-2 pain range, you need to use inserts for dancer's padding and arch support, shoes with rocker bottom, removable boots, etc. You can not just go outside the 0-2 range and expect to heal (less predictable). 8. Finally, my husband and I are considering having more children, but we have postponed it due to my foot problems. From a podiatric point of view, would a pregnancy be ill-advised (e.g. in terms of weight gain, hormonal changes, etc)? If we should continue postponing it, when can I be well enough to manage a pregnancy? Dr Blake's comment: Pregnancy will change the demands needed to maintain a 0-2 pain level, but should not be a reason not to have children. Of course, what do guys know about such matters!! I just think you can deal with it during that time. I have attached MRI- and x-ray images, in addition to pictures of the last stiff-soled shoe I used together with a sole I put into it in order to relieve the pressure on the sesamoids. Thank you in advance, and I really hope you can help me! The Patient then replied to my comments. Thank you so much for helping me! I cannot express how relieved I am to hear that there is still hope for my sesamoids, even after 8 months of pain. It really made my day, as I’ve been rather pessimistic after the visit at the orthopedist. Attached are some of the MRI images showing the sesamoids in addition to the x-ray of the right foot. It was a bit difficult to pick images showing bone marrow edema, since I’m not sure about what I’m looking at (no doctor has explained it to me, I’ve only been told that the MRI is showing bone marrow edema). - Dancer’s pad/other orthotics: I’ve been using a dancer’s pad (home-made of felt) for only a a couple of weeks because I discovered your blog only recently. Before that, I used the blue sole into the post-operative shoe I’ve got (images of both attached in the first mail), but this sole only seems to provide some arch support, it doesn’t protect the sesamoid specifically. Right now I’m trying to wear the blue soles combined with a dancers pad in Hoka (One One) shoes because this feels most comfortable. Before I’ve been thinking that the Hoka shoes haven’t got soles stiff enough, but perhaps they are acceptable? Especially since you recommended rocker bottom shoes. I can also mention that I will have somewhat more customized soles made soon. - About the pain: As I mentioned, I find it quite difficult to find an acceptable pain range. Still, I think I am in the 0-2 pain range most of the time and have been for about 1,5 month (after getting that post-operative shoe). However, I feel very constrained by how little I can do when staying in the 0-2 range. Luckily, I can still work because I have a sedentary job, but that’s about it. To be honest, I don’t really have a plan for staying in the 0-2 range other than not walking too much on the foot (which is perhaps a bad plan in the long run). - I will have my vitamin D level checked the next time I have an appointment with my doctor (which is in about a week). I have also scheduled an appointment with a physical therapist next week, because this was what the orthopedist recommended. But I’m still not sure how that can help me right now, considering that I feel quite immobilized for the time being. This also leads me to what you said about the different aspects of treatment – e.g. dancer’s padding and orthotics, but also activity modification and foot strengthening. I guess I’ve been doing quite a lot of activity modification for the last months – namely going from being active to being inactive. However, since I get very restless from not being able to do much physical activity, I’ve done a lot of exercises at home (e.g. push-ups on the knees), focusing on not doing anything that puts weight on the left foot. Maybe the physical therapist can help me find even more appropriate alternative exercises? I’m not entirely sure about what you mean with foot strenghtening, although I can understand why it might be needed. After I began the contrast baths, I’ve tried to wriggle my great toe in a non-painful manner when in the warm water – and I’m quite shocked to see how stiff and difficult to move it has become! Therefore, I would really appreciate more advice on the different aspects of treatment – especially foot strengthening. If you have the time to do that in separate posts, as you mentioned, that would be really great. 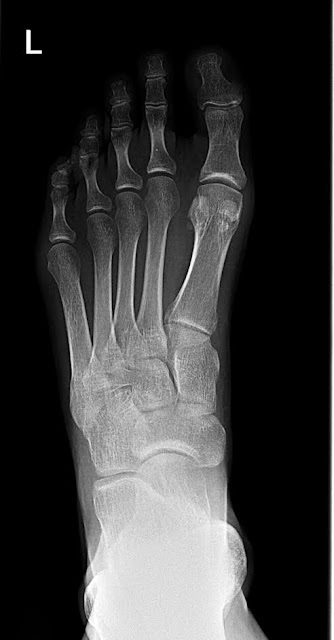 Finally, having read about sesamoid fractures in medical journals, it worries me a bit that avascular necrosis is said to be a potential complication of sesamoid fractures. When having a sesamoid fracture for months (and potentially 1-2 years, in my case), do I run a risk of avascular necrosis? Is the risk higher the longer one has a sesamoid fracture? Again, thank you so much for helping me! I’m looking forward to your next post. If you need other MRI images than the ones I sent, just let me know and I will try to pick some better images. Hi there Dr. Just wondering what your email address is as I'm hoping to get some advice from you?